Kinetic River Corp. was founded in February 2010, and started commercial operations in July 2011. The company was built with a focus on flow cytometry—custom instrumentation, technology development, and technical, strategic, and expert witness consulting. We have developed and launched two major products: the Danube (fluorescence lifetime flow cytometer) and the Potomac (modular flow cytometer). Kinetic River has been granted 6 U.S. patents, with several more pending both in the U.S. and internationally. In the last two years we have received two SBIR grants from the NIH: one to help develop a compensation-free flow cytometry platform, and another to explore label-free methods to distinguish cancer cells from normal cells. 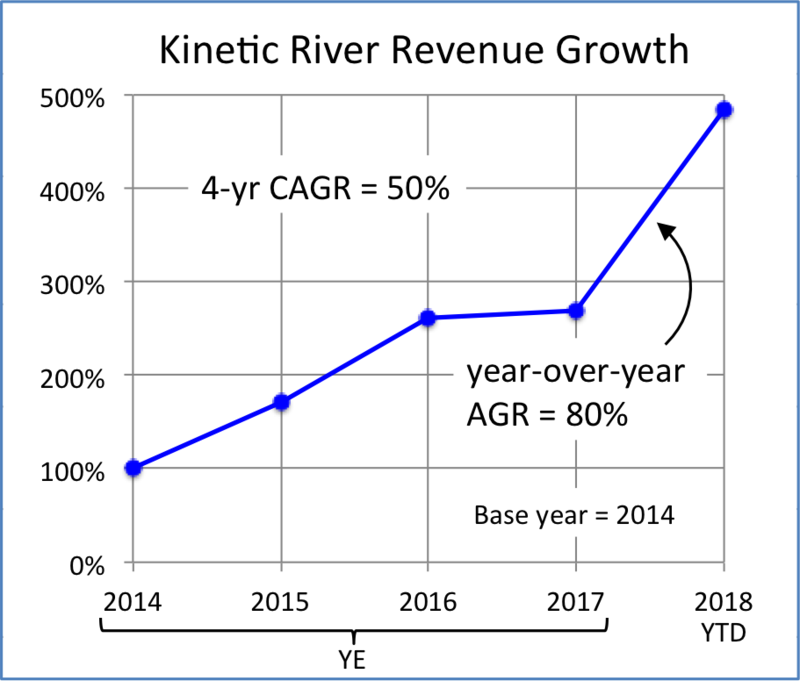 Beside the great validation that comes from issued patents and research grant awards, perhaps the best sign of progress and expansion is Kinetic River’s revenue growth. Since starting literally from scratch 7 years ago, our business has exploded in the last few years, with the 4-year Compound Annual Growth Rate (CAGR) going from 17% (2012–2016), to 25% (2013–2017), to 50% projected for 2014–2018. Our year-over-year growth is 80%—and that’s based just on booked income for 2018 year-to-date. Expert witnessing has been an area of particularly strong growth for Kinetic River. Dr. Vacca has served as expert in 10 cases involving flow cytometry and cell sorting, including 3 currently in progress. Kinetic River’s activities have also expanded to consulting in biophotonics and optics more broadly, with clients in semiconductor equipment and solar cell manufacturing, along with a Who’s Who list of players in flow cytometry, cell sorting, and clinical diagnostics. Kinetic River has recently signed on Dr. Richard McKay, president of Full Spectrum Scientific, as its sales and applications representative for the Northeastern United States. We have worked with Rich for several years, and are thrilled to expand his role to better serve a key geographic of the company. This summer we were lucky to have a returning intern, Dario, from Archbishop Mitty High School in San Jose. Dario picked up from where he left off the previous summer, and prototyped new and improved fluidic systems for precision flow control on two experimental platforms in use in our laboratory. We wish him well as he starts college in Seattle, Washington. Kshitija Pradip Shevgaonkar, MS, has been promoted to Biomedical Scientist. KP has been in a training program at Kinetic River for the last two and a half years. She will continue to oversee all aspects of assay preparation and execution, as well as assist with other research and production tasks. In March of this year, Kinetic River was awarded another competitive research grant from the National Institute of General Medical Sciences (NIGMS), part of the National Institutes of Health. The award was also recognized in a letter by Hon. Anna Eshoo, Representative of California to the U.S. Congress. The purpose of this project (Tiber) is to explore autofluorescence of metabolic factors as a parameter for discriminating cancerous from normal cells. The basic science has already been validated in microscopy studies using fluorescence lifetime imaging (FLIM); our aim is to translate it to flow cytometry, and ultimately to enable the development of rapid, label-free assays for cancer diagnostics. The Tiber approach leverages years of hardware and algorithm development carried out at Kinetic River, including work (also partially funded by NIGMS) on the Arno platform for compensation-free flow cytometry. Kinetic River was issued two more patents. U.S. Patent No. 9,952,133 expands our Arno patent family (compensation-free flow cytometry), while U.S. patent 10,094,761 adds to our Loire patent family (extremely high-throughput flow cytometry). Kinetic River now holds six U.S. patents, with several additional patents pending in the U.S., Canada, Europe, Japan, and China. 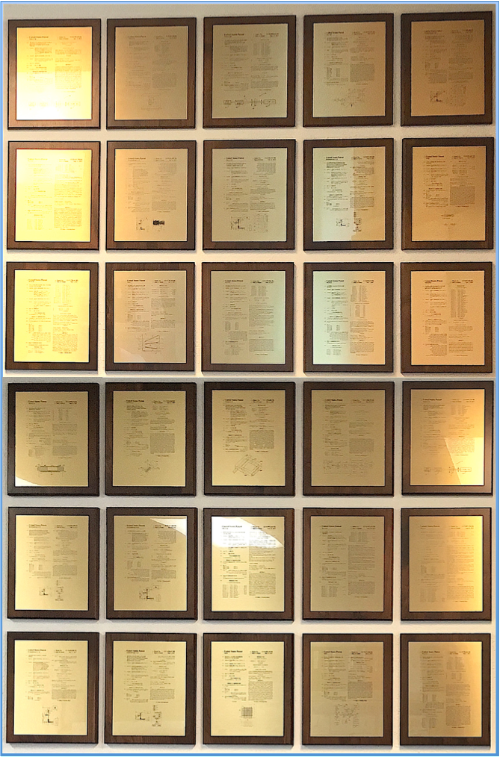 The latest issuance brings Dr. Vacca’s career total to 44 granted U.S. and international patents. 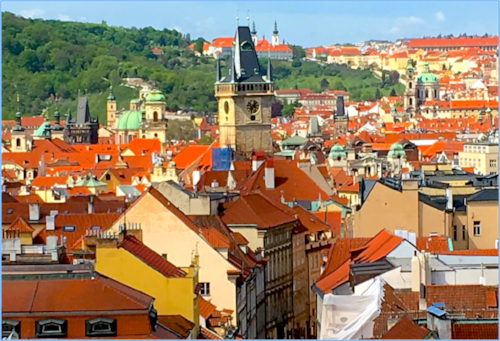 CYTO 2018 (the 33rd Congress of the International Society for Advancement of Cytometry) was held in beautiful Prague, Czech Republic, April 28 to May 2. The location was amazing, and the conference provided great opportunities for connecting with customers and partners. 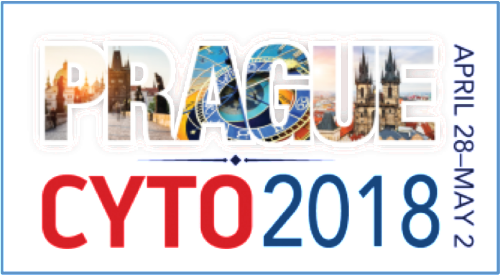 Dr. Vacca was once again a member of the CYTO Program Committee, reviewing paper and poster abstracts for the conference. Kinetic River was selected to present at CYTO Innovation, a program where new technologies are introduced in a short-pitch format. 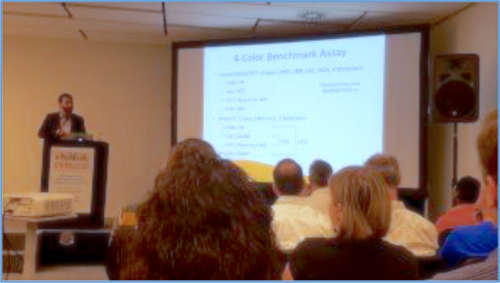 Dr. Vacca showcased Kinetic River’s Arno technology for compensation-free flow cytometry. 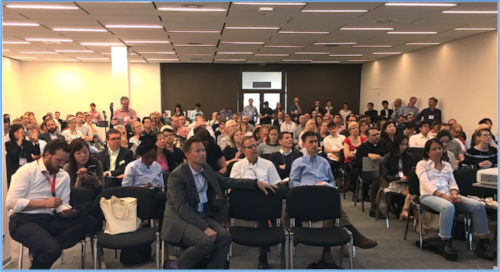 Dr. Nao Nitta (Japan Science and Technology Agency) and Dr. Vacca co-chaired the standing-room-only Workshop on Flow Cytometry Trends and Drivers this year. Five speakers were invited to discuss “hot” areas of activity in the field: Dr. John Nolan (Scintillon Institute) talked about the challenges of measuring extracellular vesicles; Dr. Martin Büscher (Miltenyi Biotec) discussed MEMS sorting; Dr. Michael Zordan (Sony Biotechnology) addressed spectral flow cytometry; Dr. Dmitry Bandura (Fluidigm) talked about mass cytometry; and Dr. John Quinn (FlowJo) discussed high-dimensional data analysis. A report on the workshop is being included for publication in a special issue of Cytometry A, slated for later this year. 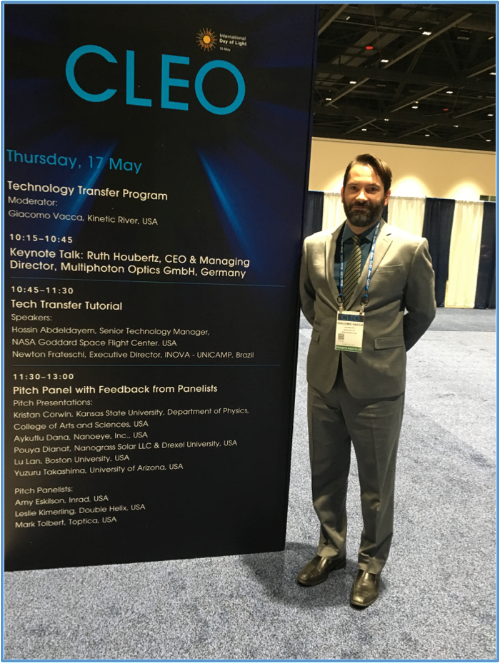 Dr. Vacca presented a paper on Kinetic River’s Arno technology coauthored with K.P. Shevgaonkar, R. Jimenez, D. Vacca, A. Singhal, R. McKay, and D. Schodin. 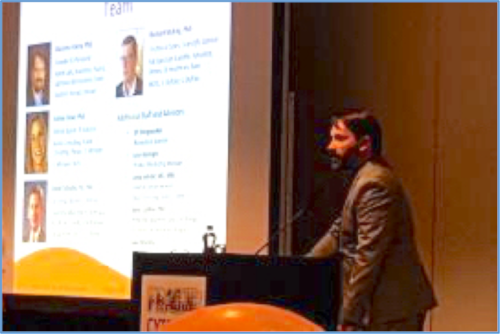 The talk discussed the latest results of our development efforts on a compensation-free flow cytometer, and the tantalizing opportunity to apply the same technology toward highly multiplexed solutions with 27 or more detection parameters. Dr. Vacca, with coauthors K.P. 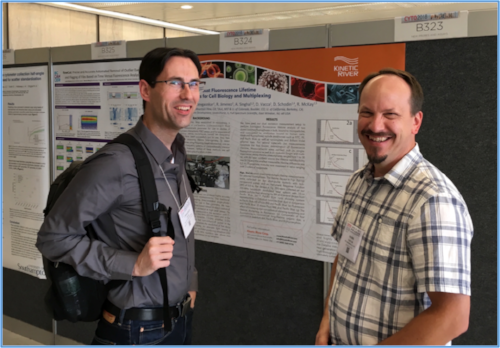 Shevgaonkar, R. Jimenez, A. Singhal, D. Vacca, D. Schodin, and R. McKay, presented a poster on using Kinetic River’s Danube analyzer to provide more robust flow cytometric measurements of fluorescence lifetime. 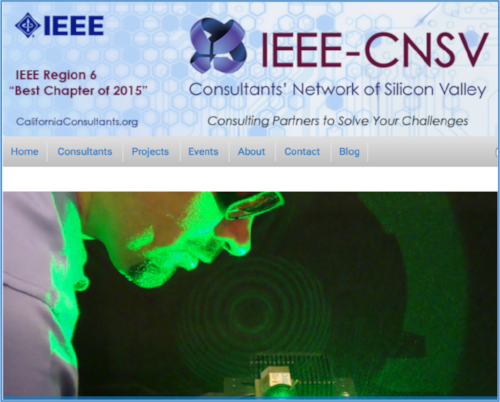 Dr. Vacca was invited to give a presentation at the monthly meeting of the Consultants’ Network of Silicon Valley (CNSV), an affinity group within IEEE. The talk took place on Dec. 12, 2017 at SEMI in Milpitas, Calif., and it reviewed many of the approaches taken in the life sciences to perform simultaneous measurements on biological samples. The full slide deck is available here, along with a recording of Dr. Vacca’s presentation. Dr. Vacca, and some of his work, also show up in cameos on the CNSV home page. 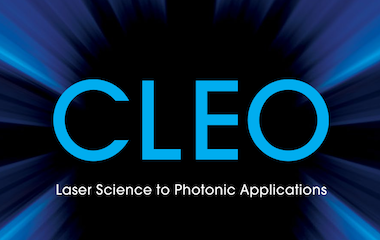 Dr. Vacca was asked once again to moderate the Technology Transfer program at CLEO, the annual conference on laser science and photonic applications held May 13 – 18 in San Jose, Calif. Keynote speaker Dr. Ruth Houbertz, CEO of Multiphoton Optics GmbH, spoke about high-precision 3D printing for maskless prototyping. The program also featured tech transfer tutorials and a pitch session including innovations from early diagnostics for cardiovascular disease to single-chip lidar for driverless cars. Dr. Vacca returned to take part in a VIP Industry Leaders Speed Meeting Lunch, organized by the Optical Society. Dr. Vacca discussed issues in optics with groups of current students and young professionals. 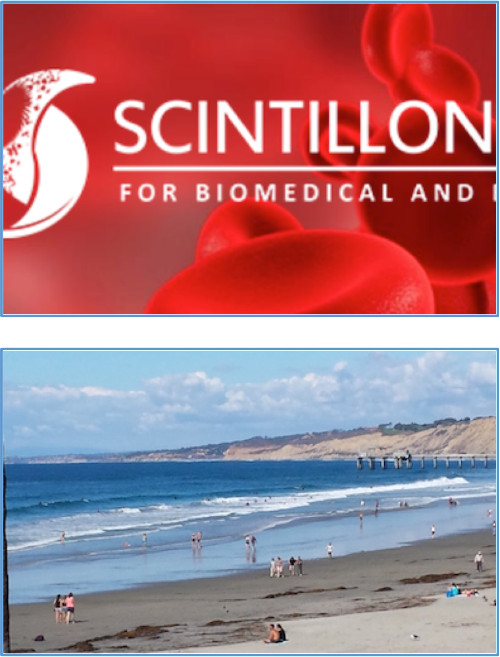 Kinetic River is a long-time sponsor of the Cytometry Development Workshop, organized by The Scintillon Institute and held in San Diego and La Jolla, Calif., November 7 – 11, 2018. The conference includes three events: Tutorials on Nov. 7; the Symposium on Nov. 8; and the Workshop on Nov. 9 – 11. Dr. Vacca will be giving a talk at the Workshop, and Kinetic River is exhibiting at all three events.